We are delighted to announce that Mai Thai Wellness Spa is the recipient of the “Signum Virtutis”, the Seal of Excellence, from the 2018 Seven Stars Luxury Hospitality and Lifestyle Awards. We are the only South African Spa, and indeed the only South African company, to have won an award at this prestigious international ceremony this year. The Awards Ceremony took place on the 6th October at the five-star Out of the Blue Capsis Elite Resort in Crete, Greece. 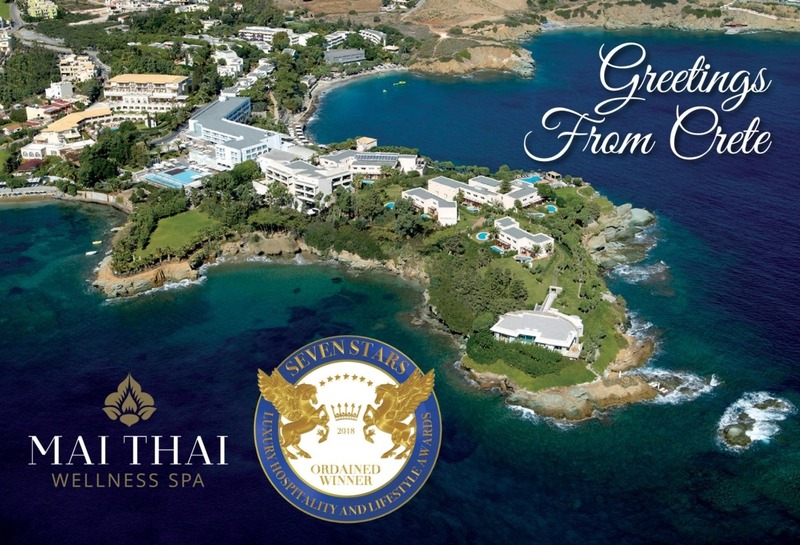 Mai Thai Wellness won the Seven Star Seal of Excellence in the Spa Sector. 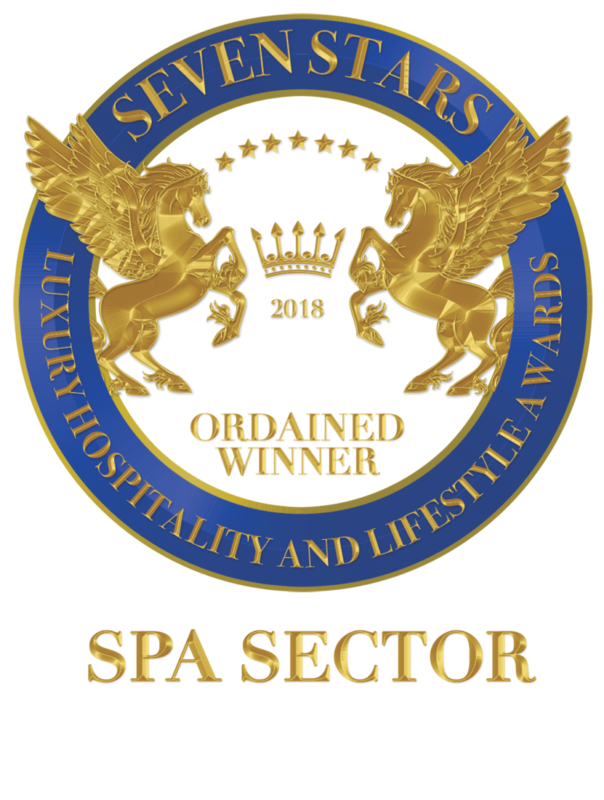 Known as the “Oscars of Luxury”, the 2018 Seven Stars Luxury Hospitality and Lifestyle Awards (SSLHLA) are acclaimed as the most sought after international luxury awards initiative, recognizing and celebrating extraordinary achievements in the hospitality and lifestyle sectors by bestowing upon winners the ‘Signum Virtutis – the Seal of Excellence’. The Seven Stars ‘Seal Of Excellence’ Awards confidently reassures the luxury consumer that the recipients are truly the best in the industry. The setting of the ceremony this year was truly spectacular in the resort’s fairy-lit Souda Garden overlooking the dazzling Aegean Sea. Guests were treated to a dinner showcasing the finest Cretan cuisine. The winners for 2018 hailed from 15 different countries including Bali, Fiji, Cyprus, Greece, Mauritius, Maldives, Turkey, Russia, Switzerland, Italy, Germany, Austria, Nigeria, Zanzibar and of course, Mai Thai Wellness Spa from Cape Town flying the flag high for South Africa. The Maldives received the Seven Stars Destination Award which was collected by Her Excellency Dr Hala Hameed. Kempinski Hotel’s outstanding 100 million-dollar investment Barbaros Reserve Bodrum received the Seven Stars Residential Development Award. Representatives of all the winners had flown in for this exclusive Gala Ceremony. HSH Prince Massimiliano della Torre e Tass; Baroness Nerina Keeley; Greek Star Nina Lotsari; Carmen Edelson; Thanos Liontos; Amani Vernescu; Star Photographer Oliver Jiszda; Miriam Seferian and Andrea Luri were amongst the Luxury Panel Members of the SSLHLA in attendance in order to present winners with the SIGNUM VIRTUTIS. Entertainment for the evening was provided by the Greek Mainstream Star Naya who mesmerized the crowd with her extraordinary voice, high energy and stunning looks. The event was hosted by Turkish Celebrity Presenter Ece Vahapoglu who brought glitz and glamour to the stage with her style and beauty. Khalil El-Mouelhy, Chairman President/Founder said… “We are delighted to have been the first Luxury Hospitality Award to host an event in Crete and I am sure it will not be the last time. This great Island offers fantastic hospitality, a great climate and warm people. I would like to thank all our Winners for travelling great distances to be with us and we are both happy and thankful to have been able to celebrate their success with them. I would also like to thank the Team of the Out of the Blue Capsis Elite Resort for their support and for helping to make this evening of celebrations a great success”. Partners of the event were Deli France / TO’AK / Chora Art & Home Mykonos / Ariadne Athens Skin Wellness / Quality Focus / SHENKHA / SWOLE O’Clock / Olga Karaververi and Samourakis Jewellry / Mastic Tears. Media Partners included FTN News / Greek Travel Pages / Tornos News / Carmen’s Luxury Travel / Luxury Travel Diva / Hip Greece / The Top Tier / eGlobal Travel Media / Voyagers World / Eye of Dubai / Eye Of Riad / Horizon and Beyond. The Mai Thai Wellness Spa Team is honoured to have had this chance to be further acknowledged in the worldwide hospitality awards arena. We are grateful to have been chosen by the distinguished Seven Stars Award Panel to be worthy of this award. We are proud of each member of our wonderful Mai Thai Wellness Spa Team – those in the spa and those behind the scenes that work so hard every day to give of their best. Winning at the Seven Stars Awards has established our little spa as a Tourism Leader, enhancing the image of Cape Town and South Africa as a high profile luxury wellness destination.